Helmut and Helga Schwarz, both from Germany, purchased 150 acres in 1981 and planted 50 acres to Chardonnay and Pinot Noir. The vineyard was located west of Salem overlooking the 2,500-acre Basket Slough National Wildlife Refuge. Their label design featured a wild Canadian Goose. 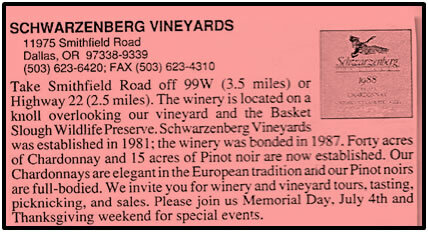 Norman Fiebig, who trained in Germany, was hired as the winemaker. The winery opened in 1987. The winery made light and fruity Chardonnay, Pinot Noir and Riesling. The wines received good reviews. In 1998 Carl & Marilynn Thoma, a partner of William Hill, became sole owner of Van Duzer Vineyards.